Hello, forex friends! Another NFP Friday is fast approaching (tomorrow at 12:30 pm GMT), so it’s time for another edition of my Event Preview to help y’all get up to speed on what happened last time and what we can expect for the upcoming NFP report. If you can still recall, I concluded in my May NFP Event Preview that the available leading labor indicators were pointing to a pickup in jobs growth, which is in-line with consensus. Moreover, I pointed out that historical tendencies supported consensus, which skewed probability more towards an upside surprise for jobs growth. Well, we did get an upside surprise alright since the May NFP report revealed that the U.S. economy generated 223K non-farm jobs, beating expectations for a 190K increase. And that’s not the only upside surprise since average hourly earnings also increased by 0.3% month-on-month, faster than the +0.2% consensus and the +0.1% recorded back in April. The jobless rate also ticked lower from 3.9% to 3.8%, which is the best reading since April 2000. But on a slightly downbeat note, the downtick was partially due to the labor force participation rate also ticking lower from 62.8% to 62.7%. Nevertheless, the May NFP report was still very good overall, so the Greenback had a bullish reaction. For tomorrow’s June NFP report, most economists forecast that only 195K non-farm jobs were generated. In other words, there’s a consensus that jobs growth slowed in June. As for the other indicators, the jobless rate is expected to hold steady at 3.8%, while wage growth is expected to maintain the +0.3% monthly pace printed in May. ISM’s manufacturing PMI report doesn’t agree with Markit’s findings since the employment sub-index eased slightly from 56.3 to 56.0, which means that employment grew at a slightly slower pace in June. ISM’s non-manufacturing PMI report supports Markit’s report since the employment index fell from 54.1 to 53.6. 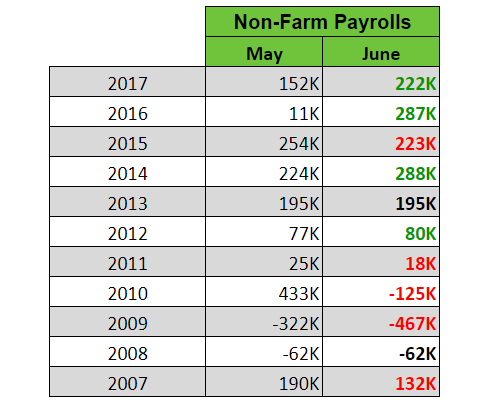 The June ADP report only showed a 177K increase in private non-farm payrolls, less than the expected +190K and weaker than the previous month’s +189K. Well, the consensus that jobs growth slowed in June does have a historical basis. However, it’s worth pointing out that the historical tendency has weakened in recent years. In fact, jobs growth accelerated more often than not in the last five years. As to how economists fared with their guesstimates, well, economists used to be too optimistic, but they appear to have been to pessimistic in recent years since there are more upside surprises in the last five years. As for wage growth, historical tends don’t really support the consensus that wage growth maintained the monthly pace since wage growth in June is usually slower compared to wage growth in May. Moreover, economists also tend to be too optimistic with their guesstimates, resulting in lots of downside surprises. To summarize, the available leading labor indicators seem to be pointing to a slowdown in jobs growth, which supports the consensus view that non-farm jobs only increased by 195K in June. Historical tendencies also support the consensus since jobs growth tend to slow in June and there are more downside surprises to boot. However, it’s worth stressing that the historical tendencies have failed to hold in recent years since there are more upside surprises in the last five years. The leading labor indicators do point to potentially weaker jobs growth, though, so probability seems to be slightly skewed more towards a downside surprise. As for wage growth, there’s a clear historical tendency for wage growth to slow in June. Moreover, economists also tend to overshoot their guesstimates, which skews probability more towards a downside surprise. Anyhow, just keep in mind that we’re playing with probabilities here, so there’s always a chance that both non-farm payrolls and wage growth may print upside surprises. And as usual, also keep in mind that traders usually (but not always) have their sights on non-farm employment when it comes to initial knee-jerk reaction. As for follow-through buying or selling, that usually depends on the other labor indicators, with wage growth usually in focus. Also, do keep in mind that even if the non-farm payrolls come in below expectations, follow-through selling is usually limited, so long as the reading doesn’t go below 100K, which are the number of jobs needed per month to keep up with working-age population growth and keep rate hike expectations alive. Furthermore, do note that the U.S. and China are expected to announce the implementation of their respective tariffs on Friday. And that may also have an impact on the Greenback’s price action. Anyhow, if news trading ain’t your thing or if high volatility makes you uncomfortable, then remember that you always have the option to sit on the sidelines and wait for things to settle down.